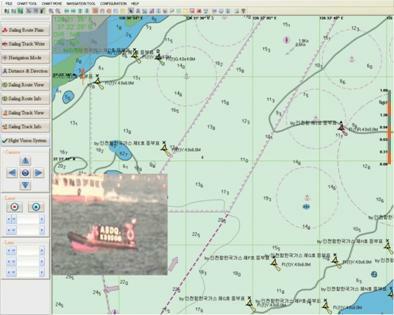 NAVIEYE is a vessel surveillance equipment which tracks target ships using LADAR(laser detection and ranging) technology and displays video image of the tracked target ship on an ECDIS/GIS display in day and night. Displaying tracked target ship information including real time target ship video image. Showing target vessel on electronic chart with video image in day and night. The video image covers ENC data.